BuzzArab is a popular site for Arab and Muslim people seeking marriage. The site has a strict moderation process and only accepts properly completed profiles. Members can communicate with each other through email or virtual flirts. Strict profile moderation on BuzzArab benefits the experience - most profiles seem genuine. On joining, you will be sent an activation email, and you'll need to confirm that you are joining the site with the intention of finding a marital partner. Though it's a free site, the first issue with BuzzArab is actually getting in! All profiles are reviewed by the site administer for approval. You won't need to upload a photo straight away, but male profiles must have at least two clear photographs before they will be approved. In my experience, it's unlikely you'll get approved without at least one good photo. But, You Can Still Look Around: Before your profile is approved, you will be able to search and browse the site, but will be unable to view full profiles of other members. Search setting can be saved. There aren't a huge array of features, as you'd find on a premium site (see the complete feature list), however all of the basics are there such as search and chat, and are straightforward to use. The strict profile moderation greatly benefits the experience, and most profiles seem genuine and sincere, and contain a useful amount of information. An internal messaging system lets you communicate with others, either through email or by sending virtual flirts. Rss Feeds. Subscribe to comments for this site. [?] Receive updates about Buzzarab.com directly through your newsreader. My acc got suspended saying that im a scammer. Is truly annoying and doesn't even give u a valid reason why it got suspended. I even encountered scammers in the website and block the person but than again my acc the one who got suspended due to unknown reason. I wish u would delete the acc immediately instead of suspend it. site managment suspended my profile for no apparent reason, they dont even notify you for what reason. if you want mariage, dating or anything, go to POF.com , free and is the best. buzzarab is useless, full of scammers.. I signed up yesterday with 6 photos and filled out my profile in full and honestly. Then this morning I got a message saying account suspended for sending copy and paste messages but I never sent even one message because my profile had not been approved. Its a useless site and waste of time to make a profile there. Good site, only one that removes bad people, bad photos. Many people angry at buzzArab because they close their profile. If you are decent and serious, they will not close your profile ! Its policy is quiet restrict & serious towards timewaster & scammers. They answer emails & complaints too. A section for personal advisor. Unfortunately, they can't be 100% secured from timewasters & scammers and you may meet some of them there, but when discovered, they close their profiles instantly. A good friend met his wife from buzzarab and now i am trying it, just started today. Looks like serious site. Online dating is not popular in arab countries. buzzArab is one of the few arab marriage sites that actually removes bad people, i'm sure the bad reviews here are by people who got rejected or their profile blocked by the management. I don't recommend this website , u can easily get fooled by guys who wanna travel to the USA, DONT USE IT as it's just a big waste of time. Replied to Prettygirl Not a nice experience! It's very common when meeting Egyptian men online they want to marry an American for visa. I don't think this is the fault of the website however! BuzzArab 2.7 23 A review of BuzzArab. 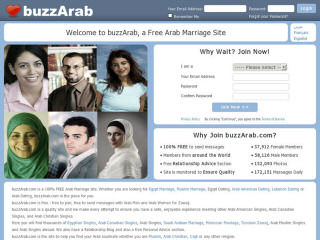 BuzzArab is a popular site for Arab and Muslim people seeking marriage. The site has a strict moderation process and only accepts properly completed profiles. Members can communicate with each other through email or virtual flirts.